Was Mitch McConnell’s Friend Behind the Clandestine Recording of His Opponent? 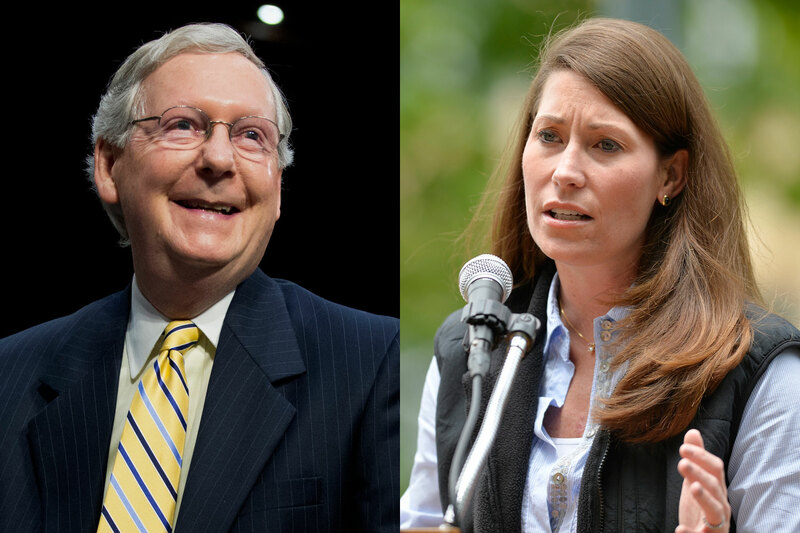 Kentucky’s US Senate race takes off-the-record to the public. It appears that Kentucky’s US Senate race will continue to be filled with recordings of off-the-record conversations that were not intended for public consumption. First was the recording of a supposedly private conversation between Senator Mitch McConnell and close advisers at his campaign headquarters in April of last year, in which they discussed using their opposition research against actress Ashley Judd, who was considering a Senate run. The culprits, a hapless Democratic PAC opposed to McConnell, anonymously leaked the recording to Mother Jones, before being outed by WFPL in Louisville. McConnell’s campaign referred to this as “Gestapo tactics,” and tried to imply that Alison Lundergan Grimes or even President Obama had put them up to it. While the Politico piece described the anonymous recorder of the audio as a “source” who is “a Washington consultant,” a Democratic operative who attended the fundraiser tells me that all available evidence points to Richard Hohlt, a super-insider DC consultant and lobbyist who worked for three Republican presidents and is a huge Republican donor—and a personal friend of McConnell. The Democratic operative tells me that there was confusion at the event about whether Hohlt had RSVPed, though he paid $500 at the door to enter. The source also says that the audio of the recording—which features Grimes moving around the room to meet donors before speaking—was taken from the part of the room where Hohlt was sitting. A recent New York Times profile of McConnell’s wife, Elaine Chao, featured a quote from Hohlt, who was described as “a friend of the couple.” Hohlt’s friendship with McConnell also includes a large amount of contributions to his Senate campaigns, the National Republican Senatorial Committee, the Republican Party of Kentucky and a long list of other Republican candidates and committees. Over the last two decades, Hohlt and his wife have given over 600 contributions to Republican candidates, PACs and committees, totaling almost $2 million. * A search of FEC reports shows that they only contributed to seven Democratic candidates over that time, totaling well under 1 percent of their total contributions. Since their contribution to Representative John Dingel (D-MI) in May of 2007, Hohlt and his wife have made nearly 300 contributions totaling $774,900, exclusively to Republicans. Hohlt has heavily donated to McConnell, as well. He and his wife have given $13,400 to McConnell’s campaigns, with his wife giving McConnell the full $5,200 maximum allowed for his current race, and Hohlt just $100 shy of that amount. He and his wife have combined to give McConnell’s Bluegrass Committee $10,000, including $5,000 after McConnell’s last election in 2008. The Hohlts also donated $20,000 to the Republican Party of Kentucky on one day in March of last year, the same month they combined to contribute $3,200 to McConnell’s Senate campaign. The Hohlts have also contributed $120,300 to the National Republican Senatorial Committee, including $91,600 since McConnell was last elected. Hohlt is also a founding member of an informal Washington salon, known as the Off-the-Record Club, where prominent Republicans, including Vin Weber and Karl Rove, gather for dinner to trade strategy. Mr. Hohlt is also a well-known background source for Washington journalists. Presented with this evidence, it doesn’t seem likely that Hohlt, out of the blue, decided one day to break his seven-year drought of donating to a Democrat—a Democrat who just happened to be running against his good friend Mitch McConnell. Asked why he would contribute to Grimes—considering his seven years of exclusive Republican support and his friendship with McConnell—Hohlt didn’t elaborate, but said he’s also given to Senator Mark Warner (D-VA). No record of that contribution exists in FEC records, but it could have happened in the current quarter. However, the Hohlts’ last contribution on record is $7,800 to Ed Gillespie—Warner’s Republican opponent. Grimes’s campaign declined to comment to me for this story, the reason for which I’m guessing is that they either want the fundraiser audio story to go away, or embarrassment for letting Hohlt in. Anyway, it surely couldn’t have been orchestrated by anyone involved with McConnell and his campaign—after all, they consider such behavior “Gestapo tactics.” Although, it might be worth asking them, anyway. *A prior version of this story understated the contributions to McConnell. Joe SonkaTwitterJoe Sonka is the news editor of LEO Weekly, Louisville's alt-weekly since 1990. He was the founder of Barefoot and Progressive, a Kentucky political blog. You can read his work at fatlip.leoweekly.com and leoweekly.com.